So, as some of you know, I’ve been cooking or overseeing the weekly Sunday crawfish boils at Alabama Music Box for a few years now (3 to be exact). This year I decided, in the spirit of that sacred American tradition-the eating contest-that we should take the opportunity to end the season with a bang. 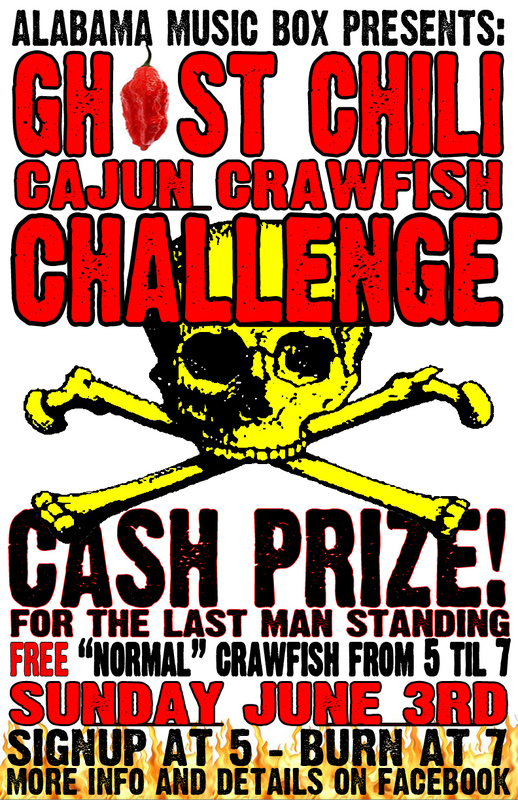 Enter the 1st Annual AMB Ghost Chili Cajun Crawfish Challenge. In case you’re not familiar, the bhut jolokia pepper, also known as the ghost chili, is the hottest widely cultivated pepper in the world rating up 1,000,000 on the Scoville Heat Scale. As a point of reference, a jalapeno rates from 3,000-8,000. I have a dozen of them in my pantry, a few of which are going to end up in the final pot of crawfish to be boiled on June 3rd, along with my already lip-blistering combination of regular ingredients. The rules are simple: Each participant is given a dozen crawfish cooked with ghost chilies, which they must peel and eat within 4 minutes with no drink or other food ingested. You drink, you’re out. Then there is a 5-minute “cool down” period in which still no drink is allowed. Every minute thereafter, remaining contestants will be given another crawfish to eat, until the last man (or woman) is standing, liquid extinguishers untouched. They take the pot and a T-shirt and the bragging rights for a year! We’ll also be cooking up or normal delicious Sunday crawfish before the contest for everyone to enjoy. Signup is the day of the event, between 5 and 6 o’clock. Just looking at the flyer gives me heartburn. Hope to see you there. Competing, or enjoying the spectacle.